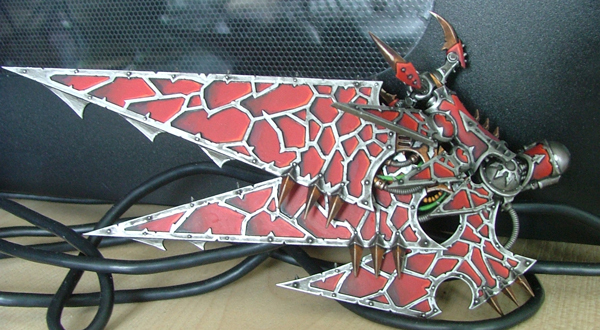 Another quick update on the Heldrake! Hoping to have it finished tonight! Managed to make something of a start on the Heldrake’s body. Still early days and the spine needs more work, but the skin took me ages. All the areas with mixed flesh and piping was particularly time consuming, but at least now it is done! 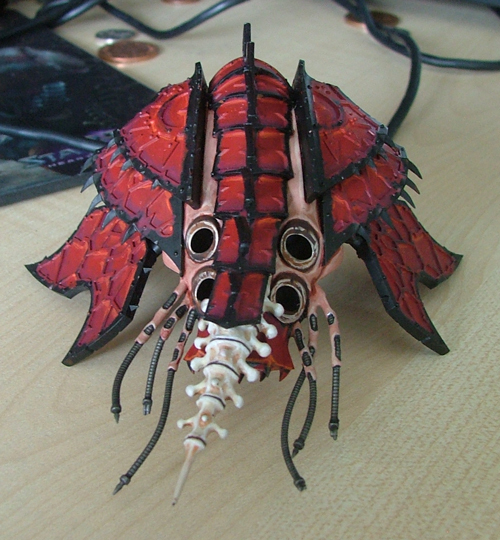 This basically leaves me with the red and silver areas to do and the model should be finished. Whilst this part is annoying, it isn’t as time consuming as the flesh parts! 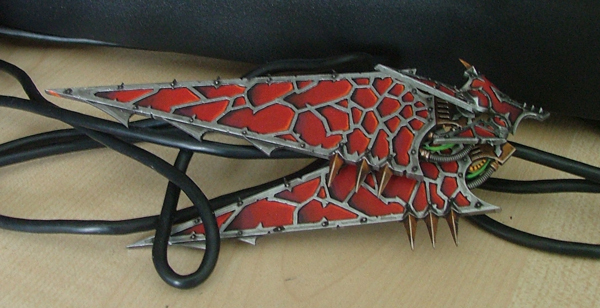 Heldrake’s head has now been given a lick of paint. I will be touching this up as the last thing to be done. 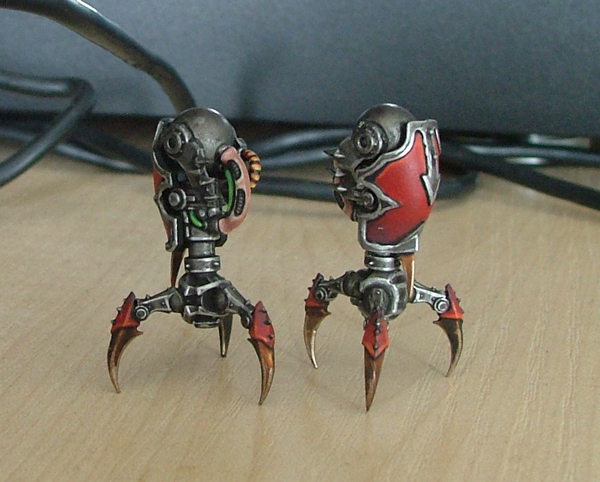 The metal work needs more depth and the eyes need a little more detail added to them. But I am so far happy with it. I decided last night that I wanted to get the body started before I finished the head so that I could just sit and focus on it without wondering how the body would fit into the rest of the paint scheme! Another update on my Heldrake. I managed to get the neck pretty much done (still needs blood added to it) and started on the head. The reasoning behind using the flesh tone I have picked is because I am heavily inspired by the Akira mutations, as seen in the film “Akira”! If you haven’t watched the movie (for shame) this is what I mean. I did attempt to paint the pipes varying colours to show different levels of pressure on the skin, but it ended up looking a little weird. Anyway, I am hoping to finish the head tonight, then it will just be a case of painting the torso and then it’s done! 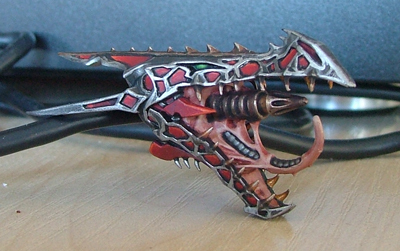 Another quick update on Helldrake progress. 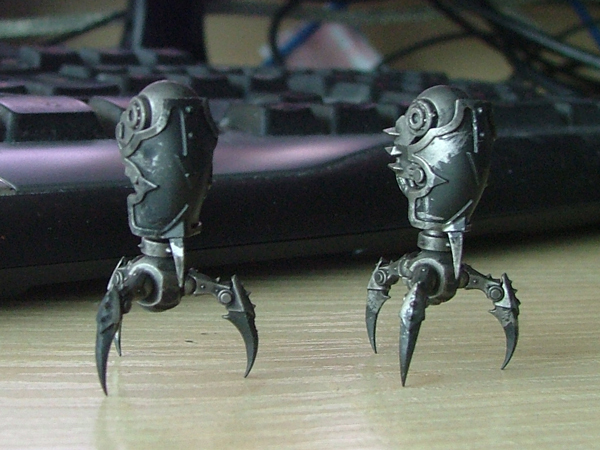 Last night I got the feet done. 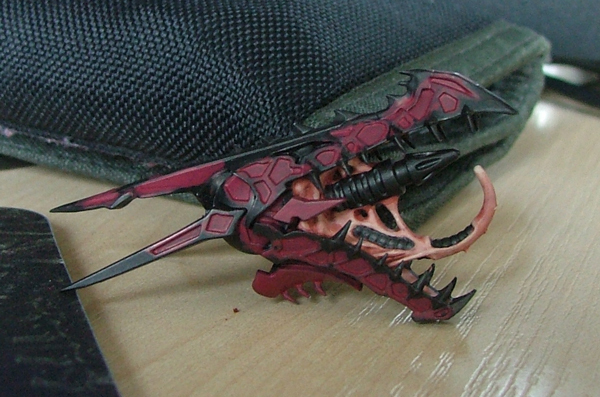 The fleshy coloured pipe on the back of the claw will eventually be touched up with some blood effects. Much like my Hellbrute was. 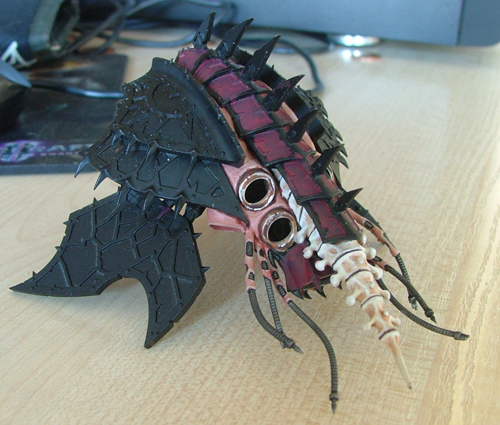 It should also give you the sense of the colours I will be using for the rest of the piped/fleshy areas on the model. It means I can retain a general overall theme for the army on the table top, and I personally think stretched out flesh on a daemon engine is cool! 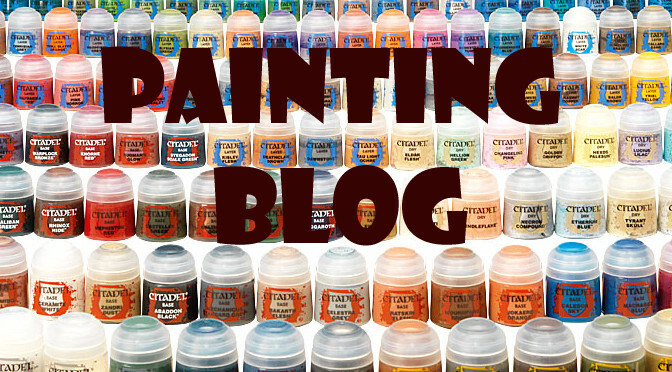 Here’s a battle report from the guys over at Mini wargaming. Pretty interesting to watch, especially the Venomthropes and their shrouding rule. I get the feeling he deliberately made sure synapse was something that would come up, as he wanted to test how the new rules work. I’ve never played against Imperial guard in the current edition of the rules, or the last edition, so it was a game I was looking forward to. (Forgive me here, because I don’t know Imperial Guard very well, so I will do my best to represent his force as well as I can). Command squad – 5 dude fellas. I think that’s all, I could be wrong, so i will fix his list as I remember it. Kingy (my opponent!) Won the roll, so he chose to set up first and go first. He placed his Three Chimera at the far corners of the table edge on his half, and one in the middle. Nicely spread out for full table coverage. 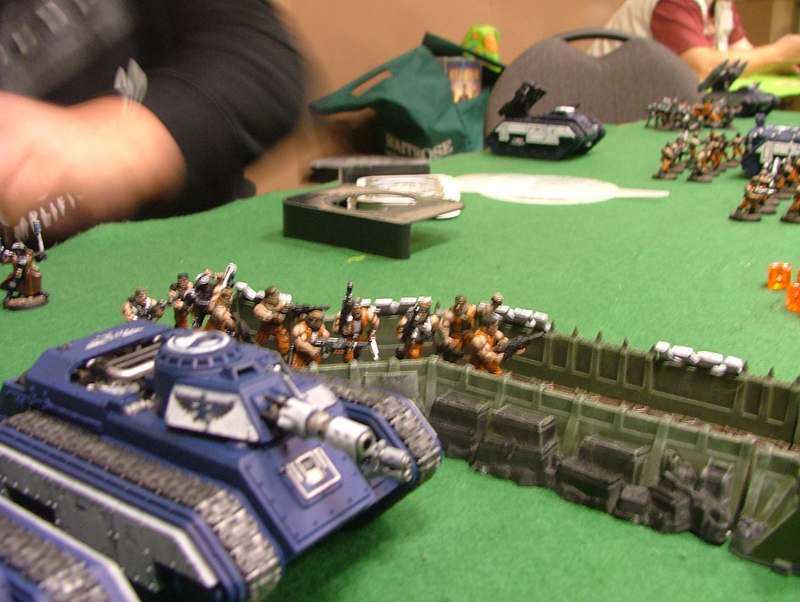 He then placed His penal legion and tanks infront of him pretty standard set up. Manyof the squads started the game in their vehicles. The ones who didn’t set up on each side of the table. In reply my set up happened with a lot of marines hiding behind walls, or trying to make themselves look less like a target as much as they possibly could. Most of them hid behind the two bastions just ahead of my deployment zone, or on the flanks in order to try and cut off the squads trying to flank me. My Daemon Prince also stood behind the bastion to prevent Line of sight, and my sorceror joined the 10 man CSM unit on the left flank. My two units of terminators stayed in reserve, hoping to drop down on any tanks that caused a problem (at this point I had no idea how good Manticore tanks are). So with the Chaos Gods already looking on me with favour, I lept into action. 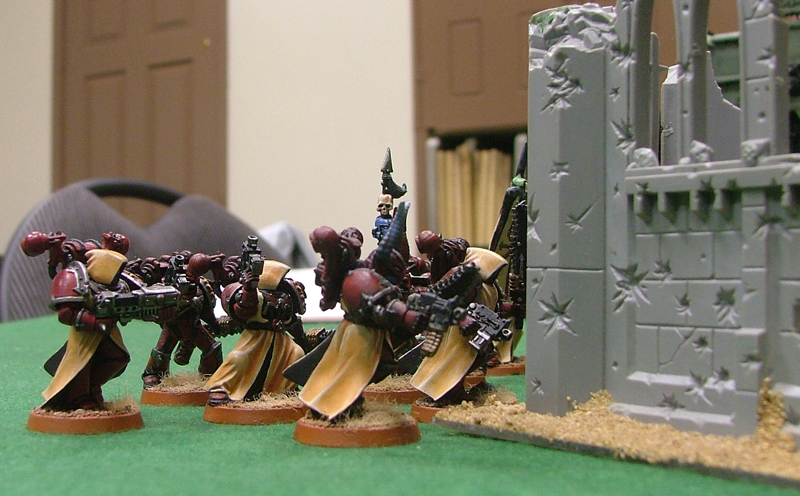 My Havocs and Obliterators moved forward into the bastions, and moved half way up the building. Next turn they will be in great positions to fire at the oncoming lapdogs of the false Emprah! My Two 10 man sqauds both advanced, with my Sorcerer casting a spell that gave him +D3 Initiative and Attacks, and getting Iron Arm off, givign him +2 STR and T. My Daemon Prince took to the skies, and flew to the centre of the board, flapping away in a swoop in order to make sure he was a difficult target to shoot at. He tried to cast two psychic powers. The first One he had was Life Leech, he rolled to cast it but rooled doubel 6 and lost awound. His second Psychic power was the Tzeentch spell Chaos Boon. He passed this time, which allowed him to roll ont he chaos boon table. I rolled 32, Bloated, which restored him to his full wounds. So a pointless round of shooting. 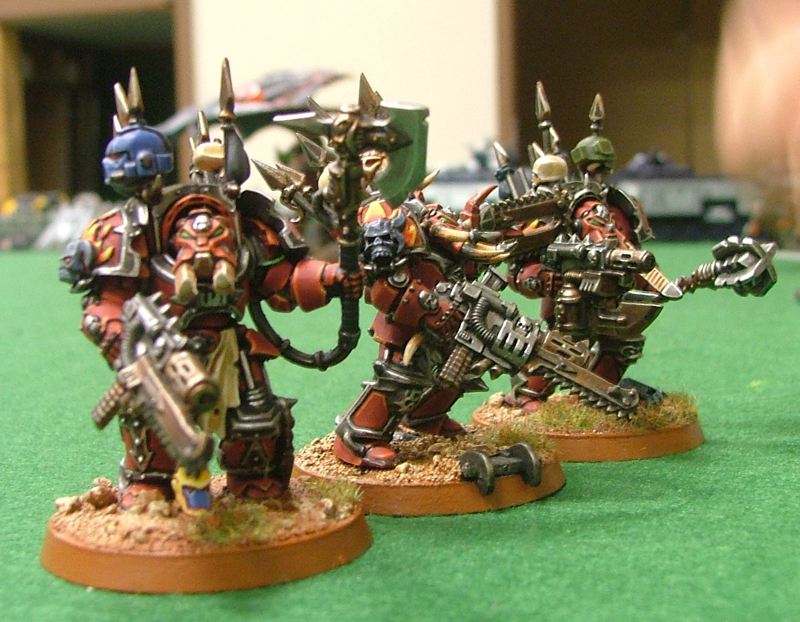 The Imperial Guard wasted no time at all with unleashing their fire-power at the Word Bearers, and his movement phase was pushed through quickly, with only the two squads on the flanks positioning to make sure they had some thing to shoot at. 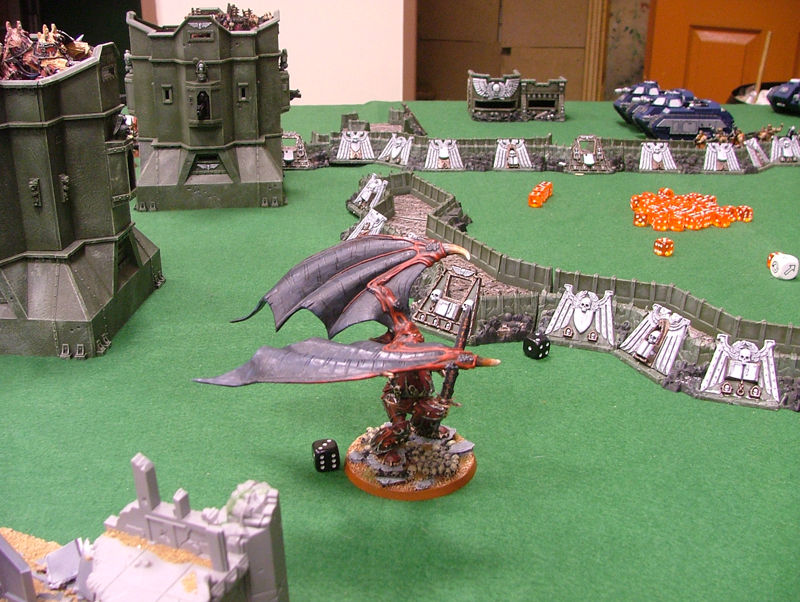 The Guardsmen tried to shoot the Daemon Prince in the sky, but all the shots missed or failed to wound. 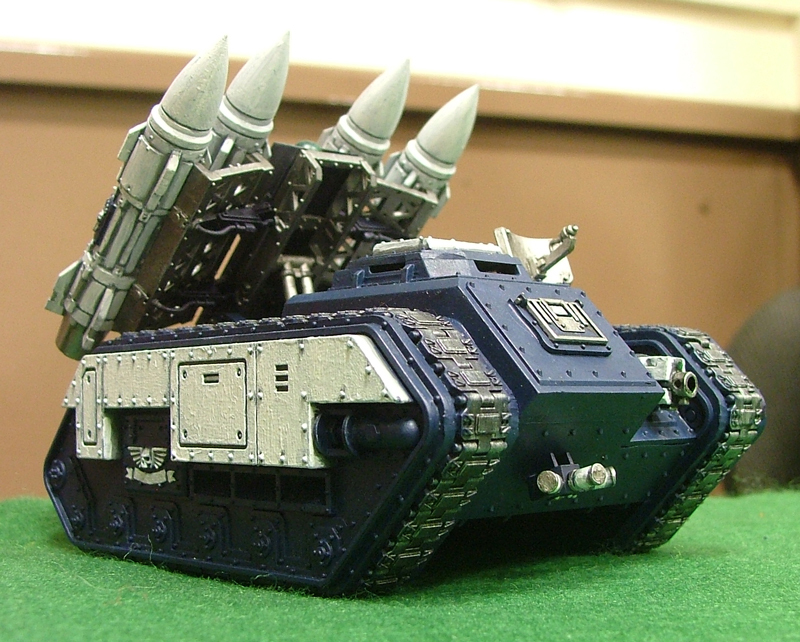 Then his Chimaera tanks with Multi Meltas rumbled up to the Bastion the Havocs were sat inside, and reduced it to a pile of molten slag, killing all the marines in the process. Furthermore, all three Manticore tanks let loose a devastating amount of fire power, cleaning up an entire squad of Marines on the left flank apart from the champion and the Sorcerer accompanying them, and taking out 5 marines on the right flank. I don’t mind admitting that after seeing so much of my army destroyed so easily, I was ready to throw the towel in. Still, I am not a sulky guy, I am really into 40k for the spectacle of the game, and nothing looked more awesome than seeing all those marines getting blown to pieces. 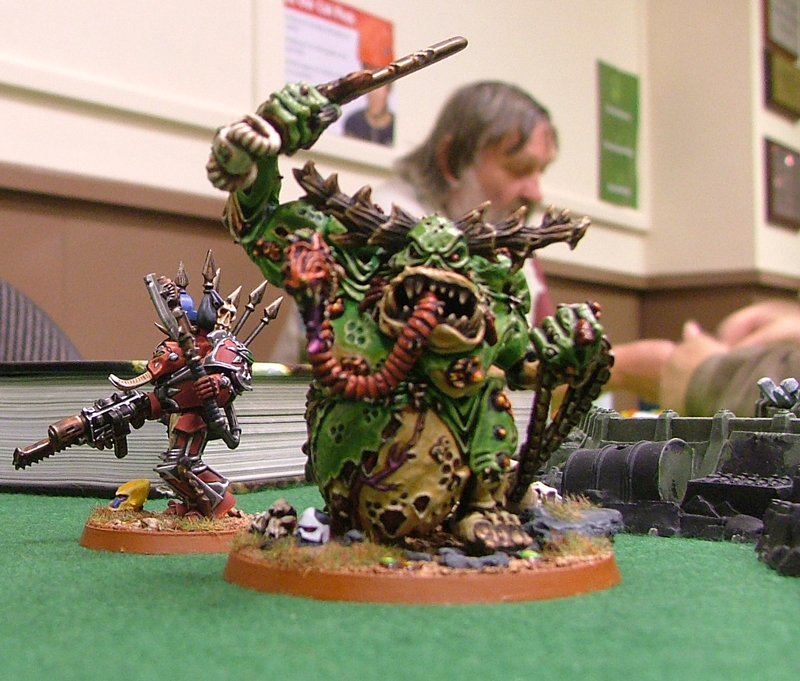 Plus, I still had my reserves and Obliterators. If I was going to lose, I was going to bring the pain to some of his army. 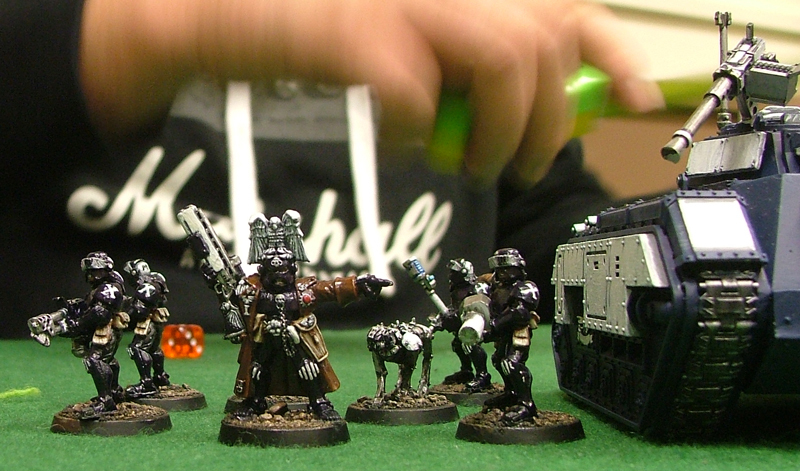 My second turn started with one squad of my terminators arriving from deep-strike on the left flank, I placed them down right near his Manticore hoping they would Shoot the hell out of it with their meltas. I gambled a little here, and placed them out of 6″ range, purely so they wouldn’t suffer a mishap. They did however hit bang on target, so I had to hope they would be able to get the job done. Sadly they didn’t, their guns didn’t even scratch the tank, which left them awfully vulnerable to the Chimaera behind them. The Sorceror and Champion on the left flank attempted to charge the Chimaera tanks, but failed, and the 5 remaining marines on the right flank edged towards the Penal squad on the right flank, letting loose some shots from their weapons, only managing to kill one due to their cover saves. 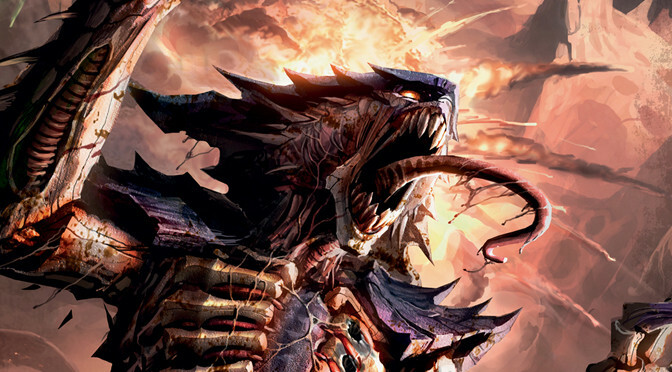 My Daemon Prince then decided to take matters into his own hands, he crashed down onto the battlefield in front of the Imperial Guard centre line, casting his Psychic powers against a guardsmen, draining his body of all vitality, and absorbing it into himself. He also Cast a boon upon himself, which granted him shrouded. After which he thundered into close combat, his black mace crunching through three of the Guardsmen, and the aura of death it permeated causing the rest of the squad to collapse like flies around him, only two Guardsmen remained of the 10 man squad he had charged. 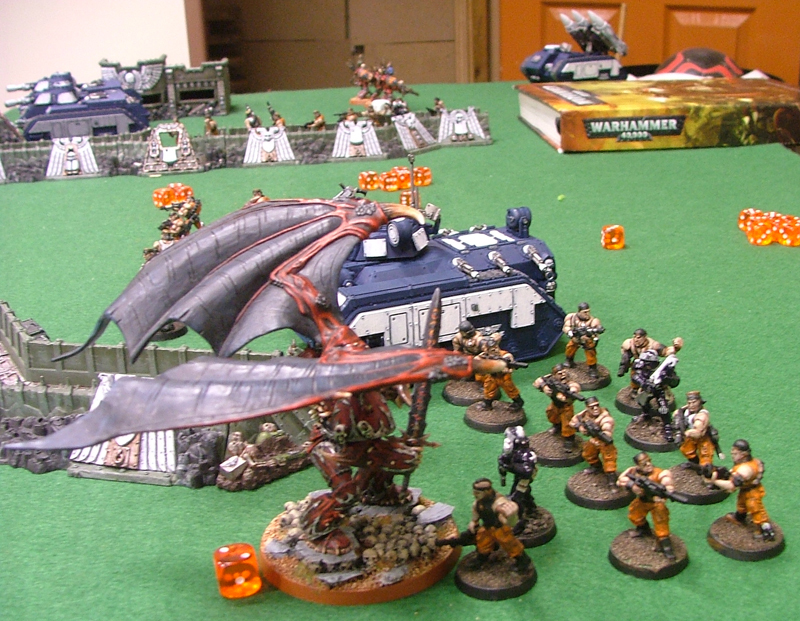 The Imperial Guard responded in the centre of the table by charging more Guardsmen into the combat with the Daemon prince, and turned the Chimaera on the left flank round to deal with the newly arrived terminators. The Guardsmen on the right flank took deeper positions into the cover they were in, and returned fire at the Chaos marines but they failed to wound. The Chimaera destroyed the terminators. And the Guardsmen managed to kill off the Champion accompanying the Sorcerer on the left flank. The two Matnicores focused on the Obliterators but they made all of the saves required of them, and failed to kill anything. At this point in the game, I felt my luck changing. Both Kingy and I had lost a lot of stuff, but I felt he still had the advantage, sicne he had destroyed so much, and I was yet to wipe out anything but the one squad the Daemon Prince took care of. Thankfully, Kor Ghalbron did Lorgar proud yet again, cutting swathes out of the Guardsmen, and the Black Mace adding more and more casualties to the list. This left me feeling great as my third turn began! My Daemon prince and Sorcerer started by casting their powers on themselves, the sorcerer gaining 3 attacks and 3 initiative and also +2 strength and toughness. The Prince gained plus one strength and carried on pulping guardsmen into mush. The Terminators arrived from reserve and landed on the right flank, blowing the crap out of the Manticore (that’s more like it!). The Sorcerer Charged into the back of the two Chimaera, and focusing all his might into his force sword, crushed both tanks in a frankly dazzling display of destruction. The Havoc squad had not died in vain! 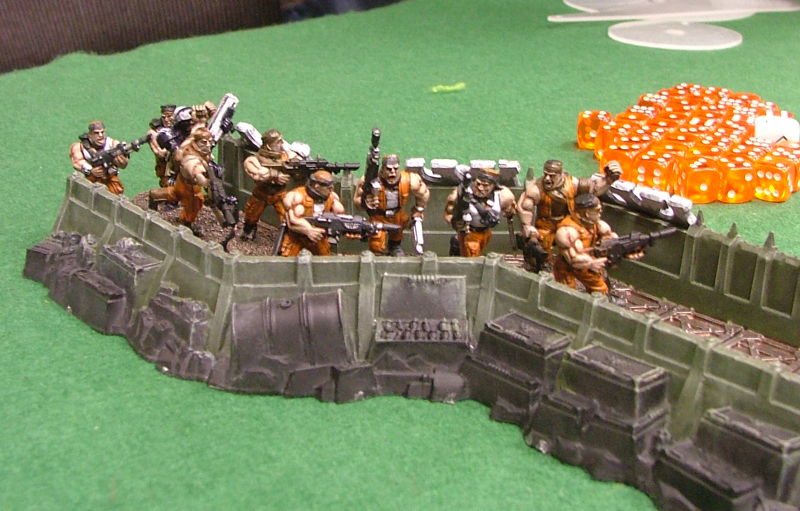 The Obliterators focused on the Squad of Guardsmen near the sorcerer managing to take out two Guardsmen who decided to go to ground and managed to avoid getting completely melted down into a pool of goo. The Close Combat between the Daemon Prince and the Last of the penal legion in the centre of the board ended with the prince wiping them all out apart from the two sergeants and one lowly legionnaire. 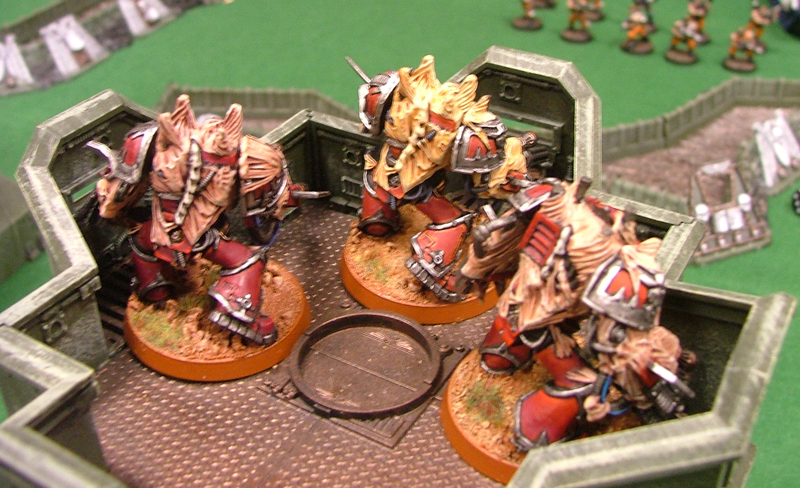 Kingy Pulled his Command squad out of the tank in order to try and take out the sorceror which he duly did. 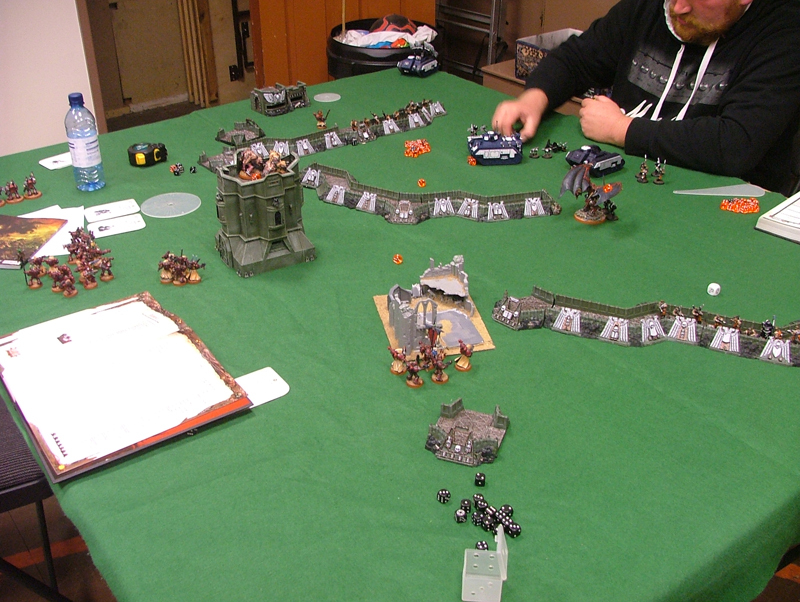 His Two remaining manticore failed to touch the Obliterators, however his Guardsmen on the right flank managed to kill three of the Chaos Space Marines, who thankfully passed their morale check. In the combat phase, the Daemon Prince finished off the last three penal legion guardsmen and set his sights on the command squad that had just killed off the Sorcerer. The turns were much shorter now both of us had taken some casualties, however the game was still pretty tense, and the Victory points were pretty even as I went into turn four! Well, the game was soonto end, but before it did, I still needed to claw some victory points back. 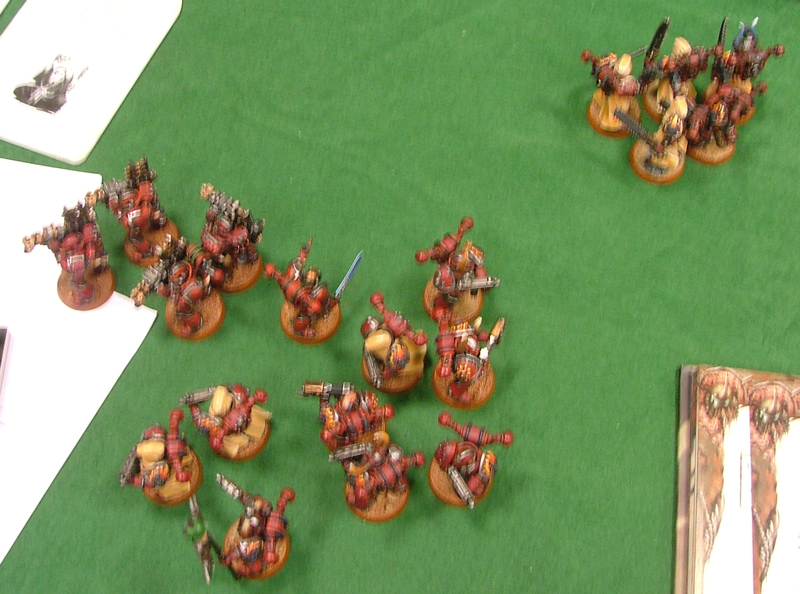 On my right flank my terminators charged into the Guardsmen who were in cover. They lost one of their number to overwatch. 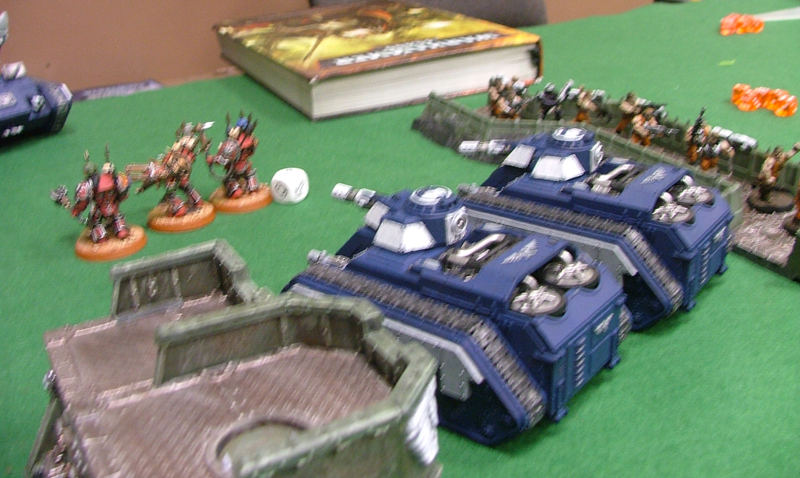 The Daemon Prince Stormed into the Command Squad, and the Obliterators managed to Stun the Command tank. In combat the Daemon prince Killed off the command squad, stomped all over their remains for daring to look upon him and live. The Terminator champion issued a challenge to the Sergeant of the Guard squad, who not onyl butchered him, but was granted Daemonhood for his long service to the Dark Gods! (My great Unclean one making an excellent model for it!). 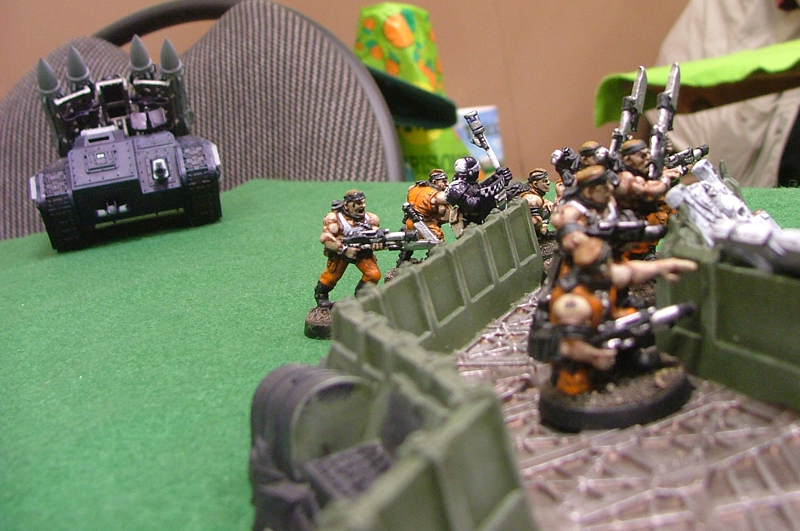 These two then made their way to the Imperial Guard Deployment area for the Linebreaker victory point. Nothing of note happened in the Guard turn, the Guardsmen on the left flank tried and failed to shoot the Daemon Prince, and the Manticore fired its last missile off but it failed to scratch the Obliterators. My last turn had arrived, and I was quite keen on making it count. Sadly the dark Gods disagreed with me, and for some reason chose to turn my Daemon Prince into a Chaos Spawn as he beseeched them for further power using the psychic ability Chaos Boon. This was funny as hell, but left me cursing my greed! The Oblits fired away at the tanks but failed to do much, and the Terminator and the Newly arrived Daemon prince on the right flank just sauntered a bit to make sure they got the line breaker points. Nothing at all happened for Kingy, his shots went wide and we were left to count the points up as the game ended! This was a great game, and I would like to point out how great Kingy’s guard are. They are a great themed force, with the Arbites as the commanders of the army (the police) and the penal legion all in Orange prison jump suits. It was great playing against him, and I am hopefully going to be getting at least one more game in against him before I go back to uni. The result was a close one, and i really did think he had it in the bag after the destruction of half my army in turn one. It seems that 2+ saves are the way against Imperial Guard of this variety. Sure those Manticores hit hard, but 2+ saves are the way to go to prevent mass destruction. 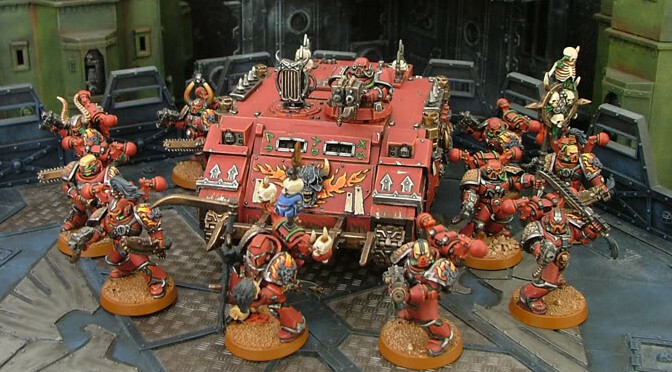 I really want to have two squads of 5 terminators with a Landraider in my army, so when I eventually get some cash I reckon they may be my next purchase. A last word should go to my Daemon Prince, who, despite being turned into a spawn in the last turn, pretty much won the game for me. 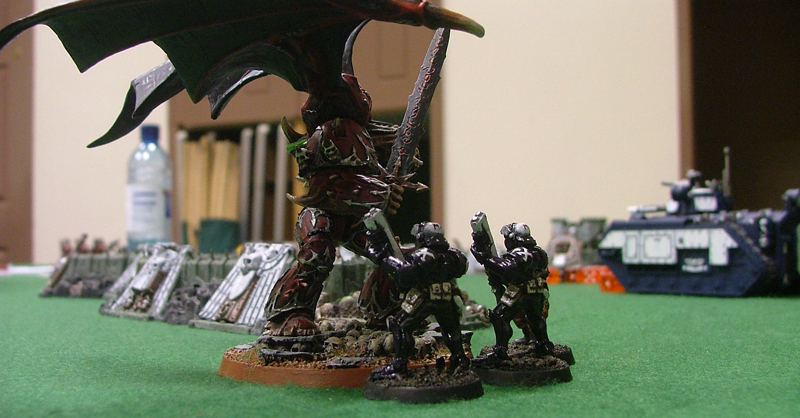 That black mace is horrific, and Kingy’s hope to tar pit him with mass guardsmen just didn’t work because of it.